Boston: Houghton Mifflin Company. Fine in Fine dust jacket. 1990. First Edition; First Printing; Signed by Author. 1/4 Cloth. 0395521513 . An attractive first printing of the first edition in just about Fine condition in alike, pictorial dust-jacket. Gray boards with blind tooled illustration of a cow on front cover, black cloth spine with white lettering, red endpapers. Signed and dated June 29, 1991 by David Macaulay directly on the front end paper. Macaulay added a charming drawing with an added "crime pays" commentary; The winner the 1991 Caldecott medal, contains a puzzle, a game, and four seemingly unfolding stories with each double-page spread: Seeing Things, Problem Parents, A Waiting Game, and Udder Chaos. "Nothing can be intelligently or intelligibly recorded on a piece of paper unless true seeing occurs: first on the part of the person making the picture, and then on the part of the person reading it. " -David Macaulay; Color Illustrations . Boston: Houghton Mifflin Company. Fine in Near Fine dust jacket. 1990. First Edition; First Printing. 1/4 Cloth. 0395521513 . A handsome first edition/first printing in Fine condition in pictorial dust-jacket with 1 inch closed tear and small chip at back panel joint, else fine. Gray boards with blind tooled illustration of cow on front cover, black cloth spine with white lettering, red endpapers; The winner the 1991 Caldecott medal, contains a puzzle, a game, and four seemingly unfolding stories with each double-page spread: Seeing Things, Problem Parents, A Waiting Game, and Udder Chaos. "Nothing can be intelligently or intelligibly recorded on a piece of paper unless true seeing occurs: first on the part of the person making the picture, and then on the part of the person reading it. " -David Macaulay; Color Illustrations . Boson, MA: Houghton and Mifflin. NF/NF. 1990. First Edition. Hardcover. no markings or names. ; 7400; 4to . MACAULAY, D. MACAULAY,DAVID. BLACK AND WHITE. Boston: Houghton Mifflin 1990. 4to, cloth backed boards, Fine in fine dust wrapper. 1st edition, first printing. CALDECOTT AWARD WINNER. Illustrated in full color by the author. Boston: Houghton Mifflin, 1990. Illustrated by author. Hard Cover. FINE in a FINE Dustjacket. FIRST EDITION, FIRST PRINTING. 32 pages, boards. An inventive & imaginative picture book that tells four separate stories or one longer story in four different art styles all depending on one's perspective. 1991 Caldecott Medal Winner, no award medal on dj..
Boston: Houghton Mifflin Company. Fine in Fine dust jacket. 1990. First Edition; First Printing. 1/4 Cloth. 0395521513 . A handsome first edition/first printing in Fine condition in alike dust-jacket. Gray boards with blind tooled illustration of cow on front cover, black cloth spine with white lettering, red endpapers; The winner the 1991 Caldecott medal, contains a puzzle, a game, and four seemingly unfolding stories with each double-page spread: Seeing Things, Problem Parents, A Waiting Game, and Udder Chaos. "Nothing can be intelligently or intelligibly recorded on a piece of paper unless true seeing occurs: first on the part of the person making the picture, and then on the part of the person reading it. " -David Macaulay; Color Illustrations . Boston: Houghton Mifflin, 1990. Illustrated by author. Hard Cover. Fine in a Near Fine dustjacket. FIRST EDITION, FIRST PRINTING. Some darkening of dj in the front gutter of book. 32 pages, boards. An inventive & imaginative picture book that tells four separate stories or one longer story in four different art styles all depending on one's perspective. 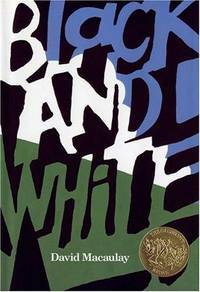 1991 Caldecott Medal Winner, no award medal on dj..
Boston: Houghton Mifflin, 19901. First Edition. Hardcover. Very good+; p.o. 's embossed stamp on front endpaper; all else-clean, tight, & attractive./As new; dj protected by new Mylar wrap.. David Macaulay. 4 to; gray boards with blind stamped illust. of a cow on front board; unpaged; illust. dj. 1991 Caldecott Medal winner. No award medal attached to dj. Innovative treatment of 4 separate stories done in 4 different artistic styles. Perspective is the theme. Condition: Very good+; p.o. 's embossed stamp on front endpaper; all else-clean, tight, & attractive. Turtleback Books. LIBRARY BINDING. 1417718005 New Condition. . New. HMH Books for Young Readers. Hardcover. 0395521513 New Condition. . New. Boston: Houghton Mifflin Company. 1990. First Edition; Second Printing. Hardcover. 0395521513 . Very Good in a Very Good- dust jacket. Discoloration to jacket at front and rear panel near spine. ; Caldecott Medal Book; 12.10 X 8.30 X 0.50 inches; 32 pages; Original unclipped dust jacket protected by archival Brodart cover. All domestic orders shipped protected in a Box. .
HMH Books for Young Readers, 1990. Hardcover. New. 12 x 8 cm. Boston; Houghton Mifflin Company, 1990. FINE quarto in FINE dj. Caldecott Medal Winner. OFFICE CHILDRENS. .
HMH Books for Young Readers. Hardcover. 0395521513 Like New Condition. . Fine. HMH Books for Young Readers, 1990-04-30. Hardcover. Used:Good. In Stock. Always but with confidence. HMH Books for Young Readers. Hardcover. 0395521513 Special order direct from the distributor . New. Houghton Mifflin Books for Children, 1990-04-30. Hardcover. Used:Good. BOSTON: HOUGHTON-MIFFLIN, 1990. FIRST PRINTING OF THIS CALDECOTT MEDAL WINNER NO STICKER EVER ATTACHED ORIGINAL PRICE 14.95 GREAT TEXTBLOCK SOLID CLEAN AND BRIGHT TOP CORNERS LIGHTLY BUMPED JACKET HAS MINIMAL SHELFWARE SOME LIGHT CREASES AND AREAS STAINED IN THE GUTTERS MINOR FLAWS TO A GRAND BOOK. FIRST PRINTING.. HARD COVER. VERY GOOD/VERY GOOD. Illus. by MACAULAY DAVID.